What can beat a big, classic diner breakfast? Eggs, hash browns, maybe some sausages fried up on the side. And of course a big hot mug of coffee strong enough to wake the dead. It’s a classic, and it’s actually pretty Paleo-friendly: you’ve got your protein and fat from the eggs, and potatoes are a Paleo-friendly source of carbs (yes, even white potatoes). A little light on vegetables, but as far as Paleo meals go, the classic diner breakfast is far from the worst. This casserole is basically that breakfast all in one dish (well, OK, except for the coffee). It’s a little classed up with fresh herbs and garlic, but that just makes the egg-and-hash brown combination even better. If you’re not huge on sausages, you could also replace them with crumbled bacon for a slightly different classic breakfast food experience. Practically speaking, this recipe is one more answer to the problem of make-ahead breakfasts. 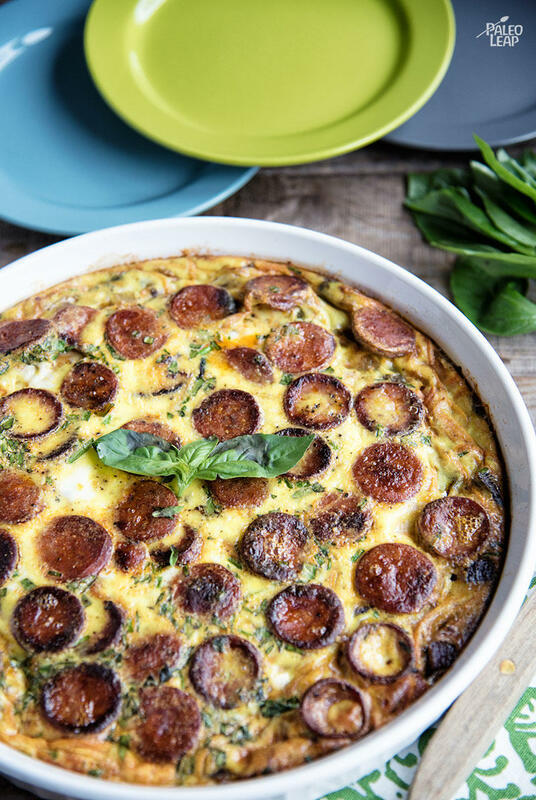 Make a double or triple recipe on the weekend (depending on how many people you’re feeding) and you can grab slices out of the fridge all week for breakfast on the run. It’s good warmed up but it’s just fine to eat cold, and it definitely beats Food Coloring Sugar Krispies as a start to the day. SERVES: 4 PREP: 20 min. COOK: 40 min. Add the onion and garlic, and cook until translucent and soft. Add the shredded sweet potatoes to the onion-garlic mixture. Cook for 6 to 8 minutes, until they’re nicely browned. Remove from the heat and place in a round casserole dish or pie plate. In a bowl, whisk together the egg, milk, chives, basil, and season with salt and pepper to taste. 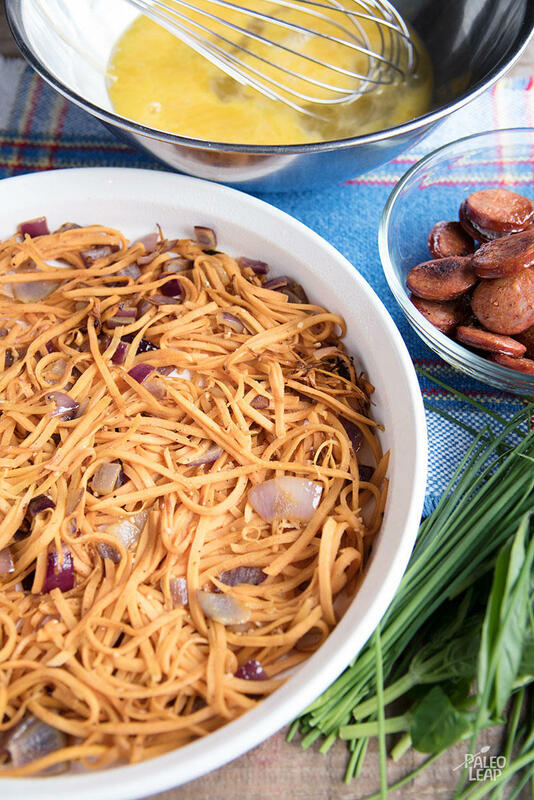 Pour the egg mixture over the sweet potatoes and top with the sliced sausages. Let the casserole rest for 4 to 5 minutes before slicing.